Two active Republican presidential candidates have released thoughtful and detailed tax reform plans, and a third has renewed his call for the tax overhaul he promoted in 2008. Sens. Marco Rubio of Florida along with Mike Lee of Utah released a plan that reduces our complicated tax system to two individual rates (35 percent and 15 percent) and zeroes out several forms of double taxation. Former Arkansas Gov. Mike Huckabee reiterated his support for a national sales tax scheme known as the Fair Tax as a key element in his May campaign kickoff event. Sen. Rand Paul of Kentucky released his Fair and Flat Tax plan that creates a 14.5 percent flat individual tax rate and a 14.5 percent “business activity” tax that some describe as a value-added tax (VAT), removing all deductions except mortgage and charity. The payroll tax on workers is also gone, as are other obscure taxes. Sens. Rubio and Paul are to be commended for issuing detailed tax reform proposals more than seven months before the first presidential primary contests, and Gov. Huckabee is an effective promoter of his approach. Other candidates have promised their own plans or suggested simply shutting down the hated Internal Revenue Service — a popular if impractical proposition, but a proven applause line, and it is hoped that other presidential wannabes will follow the lead of those already on record. But Washington interests opposed to real tax reform will do everything they can to block it. Every obscure tax provision in the tax code was secured at great cost and effort and benefits someone, but real reform remains possible. First, is the current federal tax code “generally fair and equitable”? Fully 75 percent said no, across party lines. Second, does something need to be done to force Congress to get serious about tax reform before 2020? Here 85 percent agreed something had to be done, with only 4 percent disagreeing. Third, would you support or oppose terminating the current tax code at the end of 2019 to force tax reform? In response, 70 percent supported, with only 10 percent opposing. 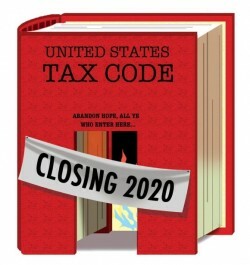 Earlier this year we launched Sunset the Tax Code, a broad, nonpartisan effort to set a Jan. 1, 2020 deadline for tax reform by passing legislation to terminate the current tax code on Dec. 31, 2019. That date is four-and-a-half years away, soon enough to create real urgency, yet far enough into the future to give Congress ample time to seriously debate various plans without spooking the capital markets. Congressional leaders already admit that tax reform is extremely unlikely in the current Congress. Senate Finance Committee Chairman Orrin Hatch of Utah recently publicly declared his “pessimism” that broad-based tax reform could move this Congress. Hope remains, however, that corporate tax reform may be possible, with some Democrats floating a proposal to use revenue from overseas profits to fund expiring highway spending. Any tax reform is helpful. Any reduction in rates or simplification of the code would be pro-growth. But despite the best efforts of the House Ways and Means Committee, there is simply no real urgency on Capitol Hill right now to pass significant reform. Nonetheless, there are two steps can provide the necessary catalyst. First, sunset (or legislatively terminate) the current tax code without specifying its replacement, but requiring that it be in place by a date specified in the sunset legislation. Proponents of all the replacement schemes — flat tax, two-tier tax, Fair Tax, VAT tax, a more progressive tax or any other new tax system — can unite around the sunset concept. Then the stage will be set for the second step: a robust, attention-grabbing, center-stage national debate that would captivate and fully engage the public. Without a deadline, Congress rarely acts. It is the nature of the bicameral body. Republican Rep. Bob Goodlatte of Virginia already has 81 co-sponsors for just such a deadline. His bill is being ushered through the House Ways and Means committee by Republican Rep. Kevin Brady of Texas. This legislation needs a subcommittee hearing in the House Select Revenue Measures subcommittee when Congress returns from its summer recess and should be considered by the full House as soon as possible. The public support documented in the McLaughlin survey is a supermajority that must be satisfied. With every passing Congress, the moment that could be seized for tax reform slips away. Nothing focuses the mind like a deadline. Colin Hanna is president of Let Freedom Ring USA, Inc.